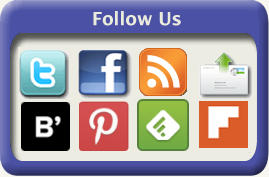 JUST RELEASED: New Child Seat Safety Guidelines! This morning, both the American Academy of Pediatrics (AAP) and the National Highway Traffic Safety Administration (NHTSA) issued new recommendations for child seats. Keep toddlers in rear-facing car seats until they reach two years of age or until they reach the highest weight or height allowed by their car safety seat’s manufacturer. 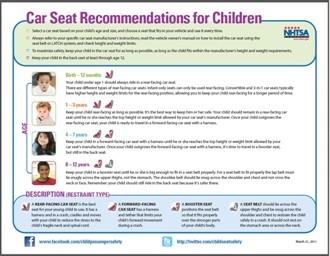 Most children will need to remain in a booster seat until they have reached 4 feet 9 inches tall and are between 8 and 12 years old. The booster seat’s shoulder belt should lie across the middle of the chest and shoulder, not near the neck or face. The lap belt should fit low and snug on the hips and upper thighs, not across the belly. According to NHTSA Administrator David Strickland, “while all car seats sold in the U.S. must meet federal child restraint safety standards, selecting the right seat was a challenge for many parents”. The “room for interpretation” in the 2002 guidelines plus the huge variety of car safety seats on the market often left parents with more questions than answers. The result: children were transitioning from one stage of car safety seat to the next, far too early to be truly considered “safe”. New research findings, however are clear. Children under age 2 are safer in rear-facing car seats. Children under age 2 are 75% less likely to die or be severely injured in a crash if they are rear-facing. The hope of both NHTSA and the AAP is that issuing these new requirements will simplify the selection process and make it easier for parents to choose the “best” car seat for their child. Stefanie I’ve got to tell you – I just read your comment on my RTT that included that Elton John picture and I laughed so hard I read it to two other people. YOU are hilarious and that story is outstanding. Most welcome! 🙂 Thanks for stopping by!